The remote location of hydropower stations is often a great challenge when major repair work is necessary. The refurbishment of a large generator in the Scottish Highlands shows how Sulzer finds cost-effective service solutions even in places miles from nowhere. Much of the UK hydroelectric capacity was built during the 1950s. These installations have performed extremely well, especially considering the methods of design calculation that were available at the time of construction. Now, having achieved over 50 years of renewable energy production, the time for large-scale overhauls and refurbishments is rapidly approaching. Although the design technology and materials have advanced considerably, one constant is the remote location of many of these sites and the inherent logistical issues that arise when working on large rotating equipment. The challenges of delivering a refurbished hydrogenerator were recently highlighted when Sulzer was awarded a turnkey project to repair one of two generators at the Lochay Power Station, near Stirling, Scotland. The Lochay Power Station, with a total capacity of 47 MW, is part of the Breadalbane Hydro-Electric Scheme. It is operated by Scottish and Southern Energy (SSE). The two main generators are English Electric 22.5 MW units, which were commissioned in 1958. The remaining 2 MW are produced by a smaller Pelton turbine, which uses the compensation water that is released into the River Lochay when the main sets are not running. The Breadalbane Hydro-Electric Scheme is located in the mountainous region in highland Perthshire and utilizes the water stored behind 6 dams. Over 20 tunnels and aqueducts carry water to 7 power stations, of which Lochay Power Station is the largest. In 2012, one of the generators started to exhibit noise and vibration issues and SSE called in the specialists from Sulzer’s Falkirk Service Center to dismantle the generator in question and investigate the cause. The stator was originally built in two halves and bolted together on the frame on site. This unusual design was used primarily because of the difficulty in transporting and moving the materials to the remote location during its construction. The investigation found that a gap existed between the two halves of the core. During the original assembly on site, this gap was filled with a strip of insulation material, but over time, this strip had gradually deteriorated and an increased clearance had appeared between the two halves of the core. When the generator started up from cold, it would vibrate until it reached an operating temperature of around 50 °C. At that point, the core would expand and lock together, and the vibration would cease. More recent energy demand in the area had seen the usual continuous operation of the generators being replaced with more frequent start and stop operation that was exacerbating the situation. Considering the mature status of these generators, it was a testament to their construction that only the bearings had been replaced during the past 60 years. However, the latest development indicated that a complete refurbishment would soon be necessary. So, plans were put in place to complete the work in the most cost-effective manner. The nature of large-scale hydroelectric power generation requires large volumes of water to descend a significant distance before reaching the turbines. Suitable locations for such facilities are, therefore, relatively rare and nearly always in a remote setting—away from major transport links and general infrastructure. As such, this can present substantial challenges in terms of logistics and moving large components that need to be repaired. In the case of the Lochay generator, these issues were compounded by the natural beauty of the surrounding area that attracts large numbers of tourists, especially during the summer months when the majority of the remedial work was being carried out. Fortunately, the Sulzer project management team has considerable experience in organizing and repairing hydrogenerators, and it was able to minimize any disruption to the refurbishment schedule. After the initial investigation, it was clear that the generator would ultimately need to be rewound. However, in the meantime, it would require a program of remedial maintenance in order to keep it operational until the more substantial refurbishment project could be organized. Sulzer worked closely with SSE to develop the maintenance strategy that could be completed during the summer months in preparation for the winter period when local water levels would allow continuous operation of the generators. Initially, a project was organized to tighten the core and rewedge it in order to reduce the noise and vibration. This patch enabled the generator to continue operating through the winter of 2013. Further work was carried out in 2014 to reinforce the end winding consolidation before it was returned to service. Sulzer worked closely with SSE on these aspects of the repair program. SSE provided engineers to remove the rotor, after which, the Sulzer engineers completed the remedial work and then allowed SSE to rebuild and restart the generator. In 2015, Sulzer embarked on the turnkey project to dismantle the generator and start the complete rewind process—which would see design improvements that would considerably enhance its performance. Using the on-site lifting equipment, the 56 metric ton rotor was removed to allow access to the stator and its windings, which were removed along with the stator core. The whole project was coordinated and run by the local service center in Falkirk. However, it involved skills and expertise from other key Sulzer service centers, including Birmingham, where the design improvements for the stator and coils were engineered and manufactured. The first of these improvements was the creation of a new one-piece core to replace the original two-piece design. The new core was constructed using over 30000 plates to create the new lamination segments. Each segment was manufactured from a standard high-grade lamination steel M330-50A-C5. The steel-specific loss was reduced from 5.75 watts/kg for the steel material used in the original design to 3.3 watts/kg in the new design. The stator contains 126 slots. The plates are designed so that half of the laminations are split at the slot. The other half are split at the tooth, which enables the core to be continuously built up, with each layer overlapping the joints in the previous layer. The new segments are arranged with minimal clearance between them to allow for thermal expansion. Additional design improvements were made, including a new vent duct beam and support ring to ensure that the new core pack would be fully supported and pressed. New press fingers were also designed. They had better clearance to the coil side to prevent partial discharge on the overhang. This had been an issue that had occurred in the original machine due to insufficient clearance. The installation process involved the construction of a ring of plates around the stator frame. This allowed 22 hydraulic jacks to be used to pressurize each core pack and to remove any air pockets. The cylinders were connected to multiport manifolds to ensure that the same pressure was applied equally around the core. Although it was a time-consuming process, it was essential that the construction of the new core was of the highest quality. This guaranteed the reliability of the generator when it was returned to service. During the core assembly, a slot gauge was constructed to ensure the correct slot alignment. The core internal diameter was measured at eight radial positions and three axial positions each to check the concentricity. The clearance between the core back and dovetail bars was also measured with a filling gauge for each core pack and each dovetail bar to check the consistency and quality of the core build. The service team used a thermal imaging scanner to check if the core laminations had a uniform temperature spread. A large generator was brought to the site to properly test the rebuilt core. It provided sufficient power to test the core at a working flux level so that both iron loss level and power factor of the iron could be checked. The core flux test parameters were recorded and the temperatures were recorded using a thermal imaging camera, which, together, determined that the new core was in excellent condition. Following the assembly of the new core, the engineers used a high-precision laser measuring device to create a complete 3D engineering drawing of the stator. This drawing was used to help create the new windings and ensure a perfect fit. These dimensions were used by the Birmingham Service Center to create a precision jig. The jig was used to double check the shape and dimensions of every new coil that was produced. The new coils were redesigned by the technical team at the Birmingham site to account for the considerable improvements in insulation technology that have been achieved over the past 60 years. The insulation class was improved from class B to class F, a modern, resin-rich insulation system. This improvement allows the thickness of insulation to be reduced, which results in an increased copper content in the slot. The new coils were redesigned to account for the considerable improvement in insulation technology since the original was manufactured. The original windings had less copper content, and a transposition from the coil-to-coil connection was employed to reduce the loss due to eddy currents (induced by the changing magnetic field). In the new design, the copper content in the slot has been increased by 20%. The winding connection has been redesigned from three parallel paths to six parallel paths. Also, the number of turns per coil has changed from five to ten. The new design delivers many advantages: eliminating the need for the transposition, which saves time; reducing the risk of connection errors; easing the winding connection; and reducing the voltage per turn. The greatest improvement from the new design is the total copper loss, which has been reduced by 10%, taking into account eddy current losses. The Birmingham Service Center manufactured 126 new coils while the Falkirk Service Center reinsulated the 12 rotor poles. While the 126 new coils were being manufactured in Birmingham, the Falkirk Service Center reinsulated the 12 rotor poles, again, using the latest class-F insulation, in order to provide consistent durability throughout the generator. At the same time, the Falkirk engineers also rewound the DC exciter train so that it was ready to be reinstalled once the stator coils were all in place. 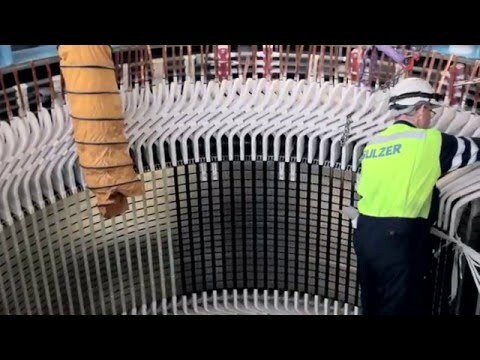 Once the new stator coils started arriving on site, the process of rebuilding the stator continued, with all of the coils being carefully positioned and wedged into place before the first round of high-voltage tests was completed. After completing the coil connections and another round of HV testing, the generator was turned into an oven by sealing the unit and installing heaters. Then, varnish was applied to the coils, and they were baked in situ. Finally, the rotor poles were reinstalled and the exciter train reassembled before the rotor was lowered back into place. Final tests were completed before the main covers were replaced and the generator was recommissioned and placed back into service. This project was managed from start to finish by the Falkirk Service Center, which reinforced Sulzer’s commitment to using one point of contact for the customer to simplify the communication process for the project. Behind the scenes, Falkirk was able to call on the technical expertise in Birmingham and bring in experienced engineers from other service centers to maintain the 24-hour schedule that was in place for a time. It is this cooperation and broad base of skilled engineers that allows Sulzer to deliver turnkey projects on time and within budget. As a result of the improved design and the use of the latest insulation technology, the overall output has increased by 15%, from 22 MW to 25.6 MW. Furthermore, these improvements and the physical assembly of the stator greatly extend the working life of the generator for another 40 years.